The Mars-bound comet was discovered by Rob McNaught on Jan. 3 at Siding Spring Observatory in Australia. Scientists estimate that this comet arrived from our solar system's distant Oort cloud and has been on a more than 1-million-year journey. The comet could contain volatile gases that short-period comets often lack due to their frequent returns to the sun's neighborhood. Scientists expect the comet's closest approach to Mars to occur on Oct. 19, 2014, at about 11:45 a.m. PDT (18:45 GTM). New observations of Siding Spring have allowed NASA's Near-Earth Object (NEO) Office at the JPL to refine the comet's orbit. The latest orbital plot places the comet's closest approach to Mars a little farther out than previously estimated -- at about 73,000 miles (117,000 kilometers) from the surface of the Red Planet. Zurek said the comet's close encounter with Mars is an exciting prospect for researchers. For example, MRO's High Resolution Imaging Science Experiment -- or HiRISE camera -- should get several pixels across the comet nucleus. "So, there should be some fascinating science that could result from observations by various instruments at Mars of the nucleus, coma and, of course, the tail," Zurek said. NASA's Curiosity and Opportunity are located near Mars'equator, so their best views of the comet from the Martian surface may come when the comet is visible during the predawn hours, low over the southeast horizon. However, "More information is needed before we can understand what they might see," Zurek said. 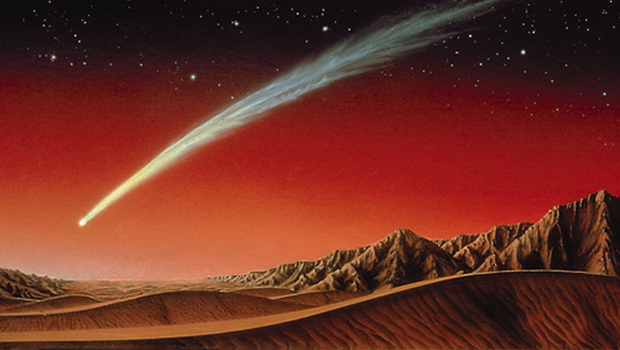 There is a slight possibility that the comet could graze or even hit Mars, Zurek said. "If that is not ruled out by future observations of the comet, we will have to start thinking about what precautions we should take," he said. Those safety measures would include positioning the orbiters so that they are on the other side of Mars at the time of comet impact. "We are not worrying about that right now, since the probability is very low and likely to be ruled out in the next few months by continued monitoring of the comet's progress," Zurek said. Even tiny comet dust particles traveling with a relative velocity of 56 km per second (just over 125,200 mph, or 201,600 km/h) could sandblast Mars-orbiting spacecraft. The satellites could potentially be ordered to turn away or feather their solar panels to mitigate the possible dust impacts. However, according to Zurek, the distance between Siding Spring and Mars will be 100 times smaller than the distance between Comet ISON and Mars. "That's close enough that the orbiters -- Mars Odyssey, MRO, and the European Space Agency's Mars Express -- at least could see structure in the coma, and tail and make estimates perhaps of particle size, etc.," Zurek said. "ISON observations also would help us practice for Siding Spring's much closer passage a year later." "We are certainly expecting to observe Siding Spring with HiRISE and other MRO instruments," added Alfred McEwen, director of the Planetary Image Research Lab at the University of Arizona in Tucson and the principal investigator for MRO's HiRISE. "Potential hazards to the spacecraft and instruments will be analyzed," McEwen told SPACE.com. But the probability that this will be a major hazard seems low -- at least to me -- but the trajectory and comet properties remain poorly known. We have plenty of time to study this and get ready." Leonard David has been reporting on the space industry for more than five decades. He is former director of research for the National Commission on Space and co-author of Buzz Aldrin's new book, "Mission to Mars - My Vision for Space Exploration," out in May from National Geographic. Follow us @Spacedotcom, Facebook and Google+. Original article on SPACE.com.